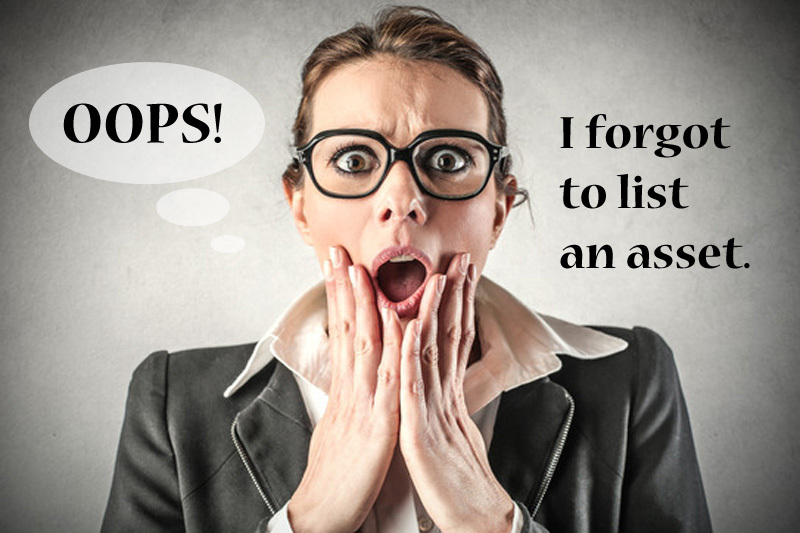 What Should You Do If You Forget To List Property You Own In Your Bankruptcy Papers? First, it’s important to give your attorney a complete and accurate list of all property you own. Don’t leave anything out for any reason. Don’t assume you can leave out any property because, for example, you think it’s not really yours since your spouse bought it in her name only, or it really belongs to your grandpa, or you’re thinking of giving it to your child. When in doubt, talk to your attorney and ask if you need to list it in the bankruptcy schedules. A commonly overlooked asset is the right to receive money in the future. For example, many people don’t list a claim for injuries suffered in an auto accident. Clients often mistakenly think, “Since I don’t have the settlement money yet, or I may not ever get any money for my injuries, I don’t have to list the claim”. Wrong! The right to claim damages is a property interest that must be listed. The same goes for employment wrongful termination claims, work or recreation injuries, and any other claims you may have against anyone you think caused your injury. You have to list those claims. Okay, But What If I Leave An Asset Out Of My Bankruptcy. Once your bankruptcy attorney has completed your bankruptcy petition and schedules, she will have you review it before you sign it. Review your bankruptcy carefully, because by signing it you swear under oath that the information is true, correct and complete. “Complete” means everything is disclosed, including all your property. It is a felony to knowingly and intentionally leave property off of your bankruptcy. It is perjury to sign you bankruptcy papers if there is false information in them, or if you know some property is omitted. If you are caught purposely leaving off property there are serious consequences. You could lose your right to a discharge, i.e., you don’t get to have your debts wiped out even though you filed bankruptcy. Also, if it’s found to be a knowing and intentional omission, you could be criminally prosecuted. A conviction for fraud could result in a fine of up to $250,000 and 5 years in prison. So What Do I Do If I Realize I Didn’t Put An Asset In My Bankruptcy? You have an ongoing obligation to tell the bankruptcy trustee about any omitted assets immediately upon realizing the mistake. If you delay informing the trustee you risk being accused of hiding the asset. Your obligation to tell your attorney and the trustee is a continuing one. It doesn’t matter when you learn of the asset. Even if the case is closed or done, you must tell the trustee so she can determine if you can keep it. What You Can’t Do When You Realize You Forgot To List Property In Your Bankruptcy. When you realize you left property off your bankruptcy you can’t blame your attorney. It won’t work. Many debtors try to get off the hook by claiming they told their attorney about the asset, and so claiming it’s the attorney’s fault. That attempt to get off the hook will not save you. No judge will buy that excuse and neither will the U.S. prosecutor. Even if you did tell your attorney about the property you left off, it will be rightly pointed out that you reviewed the bankruptcy papers and signed under oath that they were complete before they were filed. Trying to blame your attorney won’t work. So What Should You Do If You Leave An Asset Off Your Bankruptcy? Don’t leave anything off. Disclose all property to your attorney. Review your case carefully before signing the petition and schedules. If you discover an asset you left off, or any mistake you made, immediately (that means yesterday!) tell your attorney. If the asset is not exempt, i.e., not protected in the bankruptcy, be prepared to lose it. That’s better than not disclosing it and having the trustee discover it, in which case you will lose the property and risk being prosecuted for felony fraud. For a free consultation about your options, call the Law Offices of Brian Barta at (707) 542-2844 or feel free to use our contact form. Over the last 25 years I’ve helped literally thousands of residents of Sonoma, Marin, Napa and Lake Counties file bankruptcy and get a fresh start.